The Central Airlines and Frontier Airlines exhibit case at the Arkansas Air Museum is to the left on the west wall as you enter the main entrance. It contains memorabilia from both airlines for the period from 1946 to 1986. I collected and organized the exhibit. I worked for both airlines in Fayetteville from August, 1964 until January, 1982. I worked elsewhere for Frontier until it ceased operations in August, 1986. Now I'm retired and serve as Secretary on the museum's board of directors. Central Airlines and parties to the "Fayetteville Case" appeared for a hearing at Muskogee, Oklahoma in December, 1953. The hearings were held before the Civil Aeronautics Board (CAB) examiner Barron Fredricks. 288 witnesses appeared from all cities involved and many supported Central's proposals. Representatives for Central included President Keith Kahle and Vice-President F. E. Howe. Subsequently, Examiner Fredricks issued a report recommending Central be granted additional airline routes to and from Fayetteville. The CAB later upheld nearly all the examiner's recommendations. Central Airlines began Fayetteville's first interstate airline service on December 7, 1954 with service north to Joplin and Kansas City, south to Fort Smith, Dallas and Fort Worth and east to Hot Springs and Little Rock. Later service was added northeast to Harrison, Fort Leonard Wood and St. Louis and west to Tulsa and Oklahoma City. The eastern segment was also extended to from Little Rock to Memphis. The city had to lengthen the runway 800 feet to a total of 3800 feet for Central's DCs to land. Since there was no room in the white hangar, a small white house was moved to the ramp and used for a terminal building by Central until September, 1960 when the white brick terminal was opened. The "chicken shack", as oldtimers called it, was halfway between the white hangar and where the white brick terminal was built. It was removed after it was vacated. 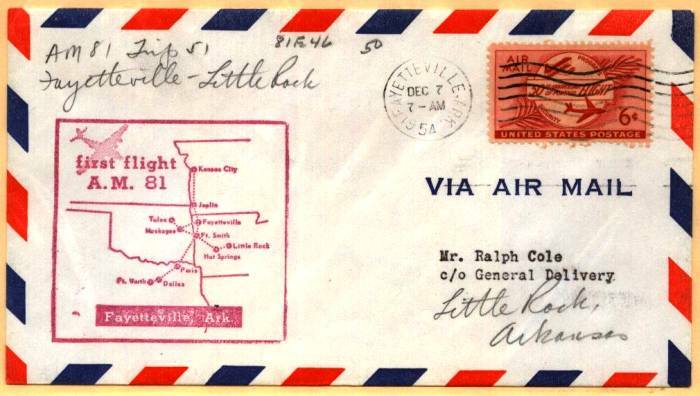 A letter carried on the first Central flight to leave Fayetteville and a photo of the "chicken shack" are in the exhibit. is part of an exhibit at the Arkansas Air Museum at Drake Field. Keith Kahle founded Central Airlines and innaugurated service on September 15, 1949 with flights running mostly north - south routes between Fort Worth and Wichita. They were a "local service carrier" and served smaller cities that major airlines didn't find profitable. Most "local service carriers' received tax subsidies to ensure service. The airline started with Bonanza aircraft but quickly switched to DC-3s, carrying 24 passengers, in September, 1950 and later began adding Convair 240s to their fleet in March, 1961. The CV240s were converted to turbo-prop Convair 600s beginning in September, 1965. Both type convairs carried 44 passengers. All three used two pilots and one flight attendant - at that time all female and called stewardesses. The airline code for Fayetteville was, and still is, FYV. Because of the hilly terrain surrounding the airport, it quickly gained the nickname "Fatalburg" among the Central flight crews and personnel. Merger talk at Central had been around for several years. An agreement with Ozark Airlines, based in St. Louis with routes mainly in Missouri and Illinois, was terminated in November, 1966. Ozark's financial arrangements were faulty and they were unable to proceed. An announcement was made in June, 1967 that Frontier Airlines would buy Central Airlines and the merged operation became effective October 1, 1967. Frontier Airlines originated with three small "local service carriers" operating in the Rocky Mountain region. Monarch Airlines, based in Denver, Colorado had started service on November 11, 1946 and was the strongest of the three. Arizona Airways was based in Phoenix, Arizona and Challenger Airlines' headquarters were in Salt Lake City, Utah. The merger of the three air carriers was effective June 1, 1950 and the new airline was named Frontier with headquarters in Denver, Colorado. After the Central merger, the Fayetteville operation changed somewhat. Two station agents were furloughed when flight reservations were remoted to a central office in Fort Worth then later to Dallas. Frontier's main aircraft was the Convair 580, a turbo-prop modification of the Convair 340 and 440. The airline phased out the DC-s and the CV600s until only CV580s served Fayetteville. The CV580 was larger and faster than Central's convairs - it would seat 50 passengers and carry larger cargo loads. Boardings and flight frequency grew until September, 1973 when Fayetteville had 17 flights daily and boarded 5,000 passengers. The oil embargo crisis the next month caused flight curtailments systemwide and service to Fayetteville never again reached those numbers. By 1981 Frontier was planning to phase out the Convair 580s and utilize an all jet fleet of Boeing 737s. Fayetteville's airport could not profitably accommodate 737 aircraft. While the Boeing could land here, the weight restrictions on payloads and fuel due to the runway length and airport approaches made it impractical and uneconomical. Frontier's operation was increasingly centered in Denver where a large "hub" was developed. Frontier's last flight into Fayetteville was January 31, 1982. Beginning in 1982, Frontier was increasingly pressured with competition at their Denver hub by United and Continental Airlines. Both carriers were much larger and started a price war in the market. The fatal blow occurred when Continental filed bankruptcy in September, 1983 but continued operations as a budget carrier with cut-rate prices. After being taken over by People Express in October, 1985 Frontier's slow decline finally ended on August 24, 1986 when operations ceased and bankruptcy was declared four days later. Continental Airlines bought most of People Express' and Frontier's assets the following month. A new air carrier named Frontier started up in Denver in July, 1994. Some of the executives from the old Frontier were involved and many former Frontier employees started working there. It is now the second largest carrier in Denver after Continental drastically curtailed their service there. United Airlines remains the largest airline in Denver. JAKE LAMKINS WORKED FOR BOTH CENTRAL AIRLINES AND FRONTIER AIRLINES IN FAYETTEVILLE FROM AUGUST 24, 1964 UNTIL JANUARY 31, 1982 WHEN FRONTIER LEFT FYV. FRONTIER WENT BANKRUPT AUGUST 28, 1986. HE NOW SERVES AS SECRETARY OF THE ARKANSAS AIR MUSEUM BOARD OF DIRECTORS.